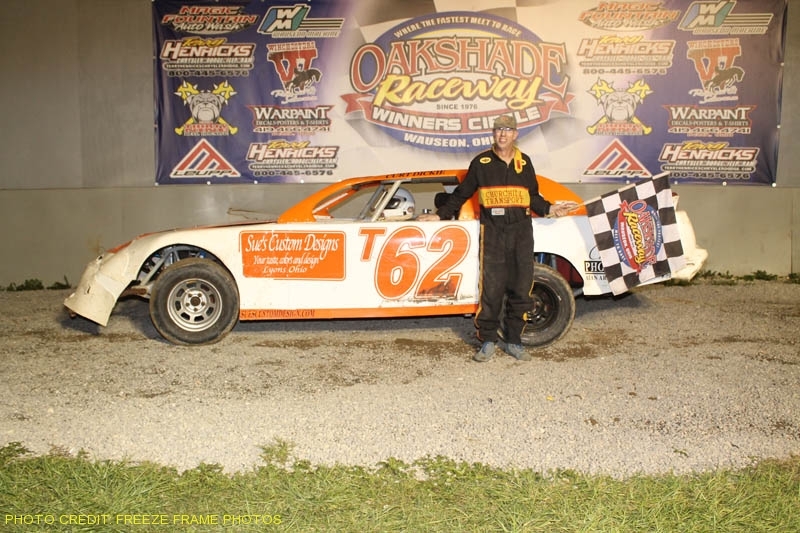 Oakshade Raceway capped off the 2009 racing season with a final 200-lap enduro race on Sunday afternoon that was won by Brad Gilbert. The object of the enduro race is to be the first to complete 200 laps or have the most laps completed in a two hour time period. Drivers take to a slick track that has been wet down at the start of the event and continue to the finish with very limited breaks in the action that only occur if a dangerous situation exists on the track. Joe Cordes, an Oakshade UMP Bomber rookie in 2009, was in command of the first 75 laps until mechanical issues forced him for a lengthy stay in the pits that knocked him out contention. Jeremy Grover and Eric Rohrs traded the lead a couple times between the halfway and 125-lap mark. Both drivers eventually had to make stops in the pits dropping them out of the top five. Brad Gilbert steadily worked his way up through the running order from 13th on lap 25 to the lead on lap 150. Besides a close call with Terry Rump when the two cars got together exiting turn four, Gilbert kept out of trouble and went on to lead the final 50 laps all the way to the checkered flag. Chris Williams, winner of the last enduro race at Oakshade, overcame a flat tire to claim second with 191 laps completed. Neil Dopp went 185 laps to finish third, two laps ahead of Ron Bloomfield Jr. who ended up fourth. Terry Rump was fifth. Robert Meinen was amongst the front-runners before losing his left rear wheel and axle which dropped him to a sixth place finish with Eric Rohrs, John Brooks, Jeremy Grover and Joe Essman rounding out the rest of the top ten finishers.